Son of Richard John and Ethel May Lillian Parker, of Hawthorn, Victoria. Brother of Phyllis Mary Parker. At enlistment : single. No previous military experience. Grey eyes, fair hair. Marks / scars : none. 29/05/1940 Taken on strength Recruit Reception Depot Caulfield, Victoria. 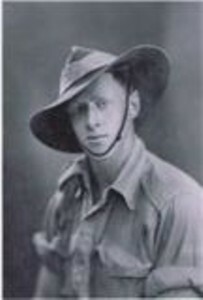 31/05/1940 Posted to 2/2 Pioneer Battalion Puckapunyal, Seymour, Victoria. 03/05/1941 Disembarked Port Tewfik, Suez. 30/04/1942 Reported missing in action, Java and transferred to X list. 18/09/1942 Reported missing in action believed prisoner of war. 04/11/1943 Reported prisoner of war. 22/12/1943 Reported interned in prisoner of war camp, Thailand. 12/09/1944 Reported missing believed drowned after hellship Rakuyo Maru torpedoed and sunk. 24/02/1945 Reported missing believed drowned confirmed by Tokyo. 10/10/1945 Became missing 12/09/1944 for official purposes - presumed dead.